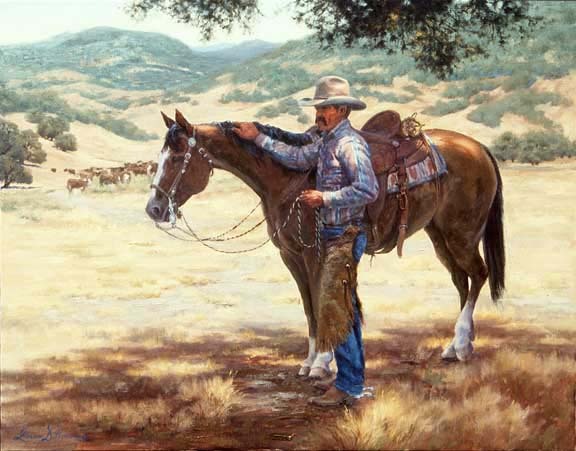 My western art depicts the cowboys, their horses and livestock, and their land. Through my cowboy paintings and prints, I invite you to join me in appreciation of our great American West. In the West, we have a rich heritage of events that shaped our country. And, in California, that heritage is especially colorful with the early influence of the Spanish and Mexican dons and vaqueros. Growing up in Southern California, exposure to that culture permeated most of my everyday life. Now in later years I appreciate the extent to which that culture has contributed to our ranching history. Painting cowboys and good, well-bred quarterhorses, often working in the style of the vaqueros of old, are among my favorite subjects. Their long days riding on their ranches, working their cattle, are prime subjects for me. Just as cattlemen are connected to their livestock and their land, I also have a strong affinity for our vast and varied landscape. 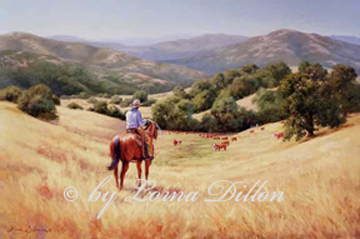 I am especially fond of painting our golden California hills. It is where many of our grand ranches are found. I hope you enjoy your visit here - your comments and feedback are welcome. © All works shown are copyrighted by Lorna Dillon who retains all rights of reproduction.